We couldn’t quite believe how serendipitous so many small things came together and worked really really well. The words ‘thank you’ are simply not enough to capture all that you did for us on Saturday. The food was incredible, service slick with nothing being too much trouble. Sophie’s help with sorting the heating was invaluable. The tent looked incredible and the tables were laid beautifully. We are so lucky to have found you. You are all amazing and made our day super special. One guest has returned an orange napkin. Apparently, they found it in their bag. I will return it through the post when we get back. Hi Nicci – we’re still getting used to being the Barkers, but loving it all the same. What a day, and weekend, we couldn’t quite believe how serendipitous so many small things came together and worked really really well. You and your team were phenomenal given the weather! I hope none got a cold from being soaked all the way through! Glad the crew were good. It’s always a bit of a risk when you’re not 100% sure on whether they will be divas or not! Can’t believe it’s all over! You guys were absolutely amazing. Wow. What can we say?! You guys were absolutely amazing. Thank you so much for everything you did to make our big day go without a hitch. It was perfect. 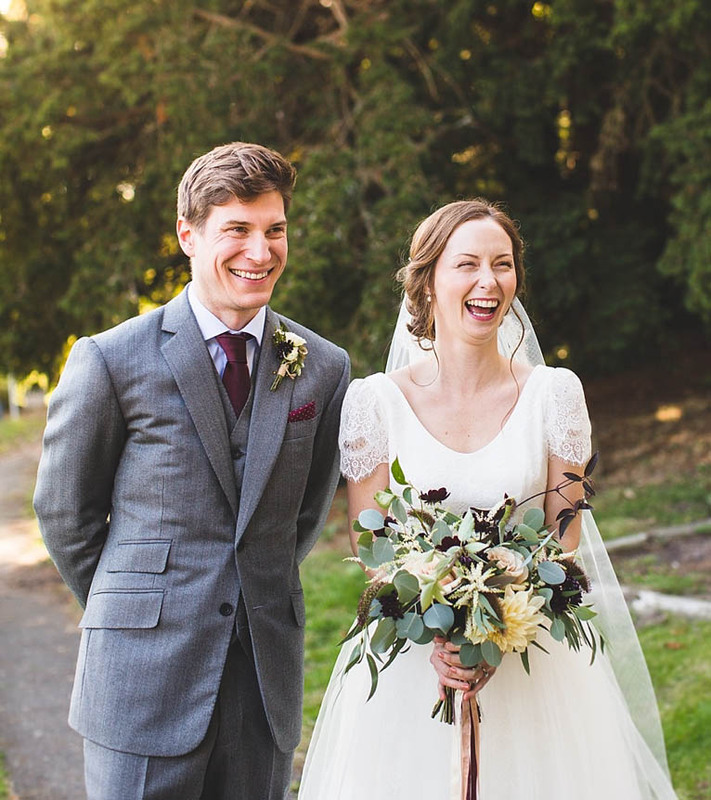 The food was unbelievable and we lost count of all the compliments we got for how brilliant it all tasted – so many “that was the best wedding food I’ve ever had”. All the extras too were just so special (the little personalised spoons and amazing order of the day sign) so thank you for those lovely little touches. We cannot thank you enough for all your hard work. Nothing was too much trouble and you put us at ease from day one. hands down the best food anyone has had at a wedding. We don’t know how to thank you both enough, we can’t put into words how perfect our day was. From our first initial meet, we knew that you not doing our wedding wasn’t an option. We have been inundated with compliments about the food, hands down the best food anyone has had at a wedding. The decorations and flowers were stunning. We had so much faith in you both, it made our day totally stress free and we could just relax with our friends and family. You have both totally blown us away, the day was above and beyond anything we could of ever dreamed of. It’s been such a fun, exciting and wonderful journey planning our special day with you both. We’re really going to miss you. Regular G&T meetups will be required. It was an absolute breeze for us as the pair of you had absolutely everything sorted from the very first meeting – giving us absolutely nothing to worry about. 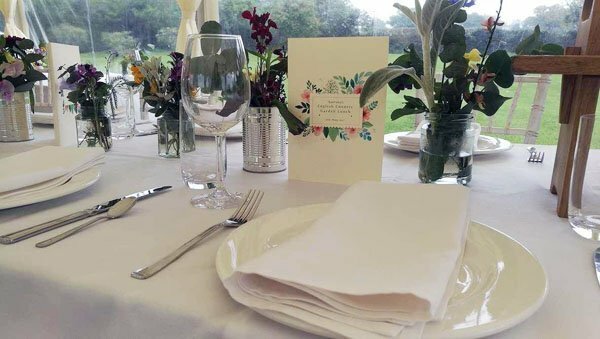 We have had countless comments and compliments – the general consensus seems to be that it was the best wedding food that anyone has ever had! And we don’t disagree. It was all absolutely amazing. Thank you so much in helping us make our wedding day the most perfect day we’ve ever had. From start to finish in all aspects, you were amazing and made our lives as stress-free as possible. We have had as many comments from how great the food was to the table service, to the bouquets and all the little touches too! So, thank you once again. We really appreciate all the hard work and effort you put in. Thanks so so much to you and your team for all they did at the weekend we had the best day of our lives and it felt so relaxed for us which was down to all the organisation from HG! Thanks for your email, sorry about the glasses . Carly and I both wanted to say how amazing you guys were on Saturday and how smoothly everything ran! We had so many compliments about the food which was amazing! Also, the flowers looked stunning, again we had lots of compliments and they really make the photos that we’ve seen so far! The staff were great, and Sophie’s mum in particular looked after us on the top table so well. Please also thank Liz for all her help on Thurs, Fri & Sat. Finally, I think I the biggest thank you / compliment I can give you and Sophie is the fact that Carly and I had no stress in the run up to the big day. You both made it such a fun process from start to finish and we came away from all of our meetings excited for the big day. Waking up to a box of beautifully packed leftovers on Sunday was also one of our favourite wedding presents! We are, in fact, still enjoying the lamb and cheese as we speak! Sophie was an absolute legend from start to finish and even managed to solve a last minute crisis with one of the waistcoats, she has many talents! 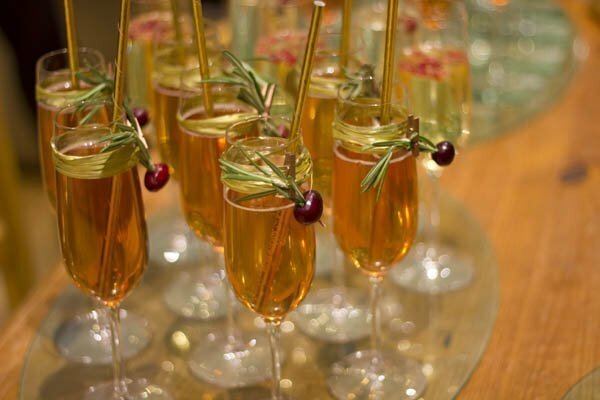 Rest assured, if anyone ever asks for a recommendation for caterers we will be quick to pass on your details! We just wanted to say the biggest thank you for everything you did to make our wedding so very special. The food was absolutely incredible; it was even better on the day than we remembered it from the tasting, if that were possible. 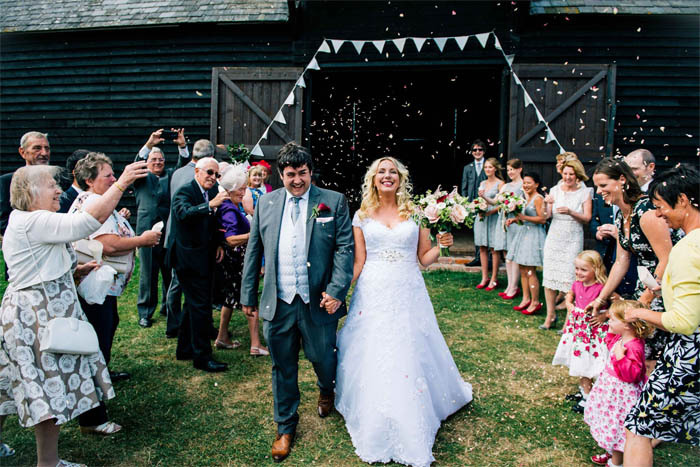 Everyone has said that it was the best food they’ve ever had at a wedding – but we knew that already! You had thought of everything, and the extra little foodie details were so special; it was particularly lovely to have mint tea after dinner, and to have so many stunning edible flowers on the dishes. The croquembouches were such a massive hit – here are a few pictures in case you’d like to see. We wanted to say a special thank you for catering so wonderfully for our guests who have allergies. Having been to so many events where my celiac Mum has been given a sad plate of potatoes and vegetables, and fruit for dessert, it was so lovely for me to see the effort you had made for her meal, and she was absolutely delighted. She said it made her feel special for once, rather than being a pain with her diet, so thank you! We are so grateful for all the effort and thought you put in to our special day. Sophie, you ran everything like clockwork! The tables looked incredible, and the drinks reception was even better than we had imagined; of course everyone loved the canapés! 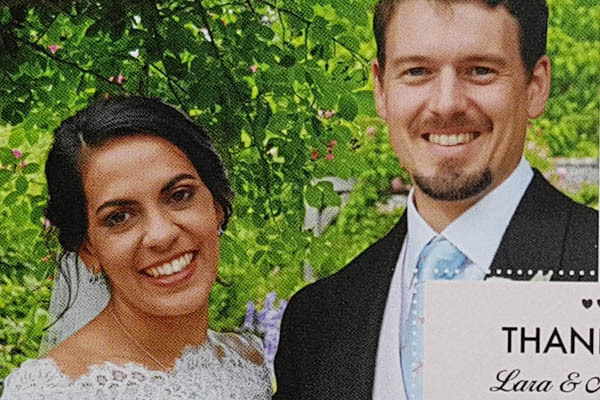 We loved all the little details you surprised us with, including the personalised straws in our glasses of Cava for the reception – that actually made it possible for me to have a drink while talking to everyone! We’ve had so many comments on how wonderful everything looked. Your waiting staff were a total credit to you; they were so professional and friendly. It was just wonderful going through the day and knowing we didn’t have to worry about a thing, though Sophie I’m so sorry I kept asking about the time – turns out that I have no ability to judge the time without my phone or watch! Finally, thank you also for making the set up and take down so seamless. It was brilliant that my godparents and parents could just relax yesterday. Thank you also for packing up the leftovers; it was so nice for us to be able to taste everything again (I’m not sure we totally took it all in on Saturday night!) and my Grandad certainly enjoyed his third massive helping of croquembouche! Sorry for such a long email, but we just wanted to let you know how wonderful it all was. We just wanted to say a huge thank you for everything you have done for us. Our wedding was just truly perfect and everything we wished for and more. We couldn’t have asked for better people to help us achieve this. You have an a amazing company nicci and one I will be recommending to everyone! And sophie thank you for being so efficient with everything, and being straight there with the vanish stick yesterday- lesson learnt- don’t drink red wine whilst wearing a white wedding dress! What can I say? You and your team transposed my thoughts, desires and aspirations into beautiful reality. I always knew I had nothing to worry about, but you surpassed my expectations! What a charming group of people you have gathered around you, it was good to see them enjoying the occasion too! From the responses I’ve had, my guests were stunned by the event, presentation and food. Most of all I felt the atmosphere you conjured up was magical! Please pass on my sincere thanks to Sophie for her artistry and organisation, Bryan, Liz, ‘the Aussie’ and your husband (for the great raw ingredients), the chap with his spectacular loos and the very efficient tent men! You’ve enabled me to bank some marvellous memories! A thousand thank you’s once again for everything. Tony & I realised some time ago that you were the people for us! So amazing from the very start. Sophie is wonderful (as you know) & we just feel that we can’t thank you both enough. You are both truly incredible!! Your staff were fabulous & our guests have all said how amazing the food was & the staff, so friendly & professional. I can’t find the words to express how we feel, but you get the gist. 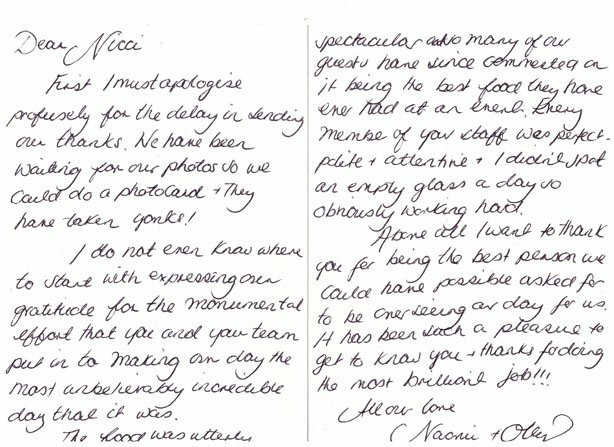 Thank you Nicci, really outstanding. I’m gonna miss you both 🙁 We will definitely stay in touch & 100% will be recommending Home Gurr’own. Thank you so much for all yours and your teams hard work on Saturday. Tim and I had a very enjoyable evening which ran incredibly smoothly thanks to Sophie and her team. The canapés were delicious, the scallop one was particularly commented on! I personally drank far to much of your gin fizz and was suffering the next morning! We are having a wonderful time. The Amalfi coast was beautiful, warm and sunny so made for a perfect start to our recovery. Florence was wonderful, so many amazing things to see. And.. Venice has lived up to expectations too. We’ve been very lucky with the weather almost to end but it is now raining quite a bit so we are enjoying a lazy day in our apartment in Venice. I’d just like to say thanks again for all the work you and Sophie did – we’ve had so many people comment on how good the food was (I wish we could do it all again) and how brilliant (& professional) Sophie was at keeping things under control. I’ve also had a few comments back on your staff too, who were amazing. The lady serving us on the head table and the young girl running around supporting my sister and my nephews in particular! They all did a fantastic job and made the day one we will never forget. We are so SO sorry that we did not have a chance to say goodbye (or even hello to you, Nicci) and thanks to you both before heading off this evening. We are now waiting for our taxi to take us to Heathrow for the two week honeymoon in India. We have the BEST Wedding day and we cannot thank you enough for all your help during the run-up and the absolutely delicious food served today. We received so many compliments, we were overwhelmed on your behalf! We will be in touch again with proper thanks once we are back from India in mid-October. We had the most wonderful day and constantly had people coming up to us saying how amazing the food was and how lovely all your staff were. Thank you. We couldn’t have imagined a better day. You made it all so perfect. Do you have a place where we can write a review? We are still in the area, and cleared the final bits from the barn yesterday. Thank you again for taking everything down and making it all so easy for us! Do you know when the lighting is coming down? We’d like to keep the lanterns if poss so we can pop down and collect those if we know when is best? The venue was fabulous and the food exceptional. Thank you so much for returning our cutlery. It has prompted us to email you, which we have been planning to do since returning from France, which is over a week now. 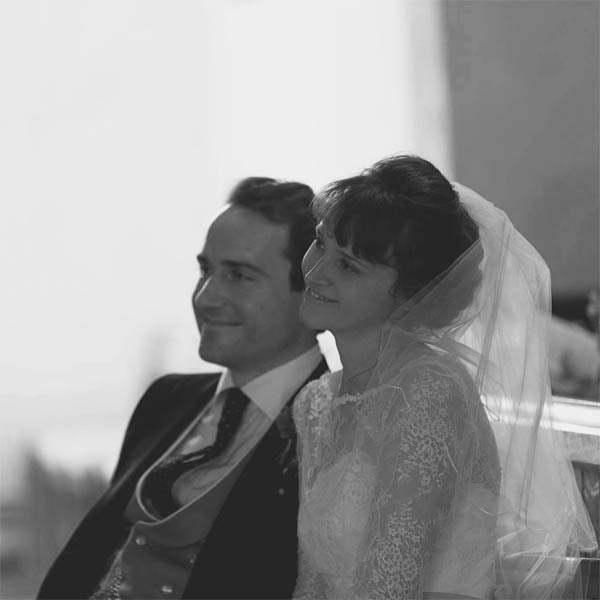 We have found ourselves telling everyone that Tom and Hayley’s wedding was the best wedding we have ever been to. The venue was fabulous and the food exceptional. The fun we had decorating the barn made the setting inside magical and Hayley’s insistence on making it child friendly was a master stroke. Alan and I cannot thank you and Sophie enough for the care and time you took to liaise with us about the food and general organisation and for then delivering on the day to a very high standard. In fact faultless. I keep thinking about how we can have another party and book you to cook for us … my 60th birthday next year perhaps! As the baby sitter was so good I am happy to let you have her details in case she can be of assistance in the future. Good luck to you and your team in all you do. Your food for my parents party was absolutely stunning – really delicious and looked beautiful. 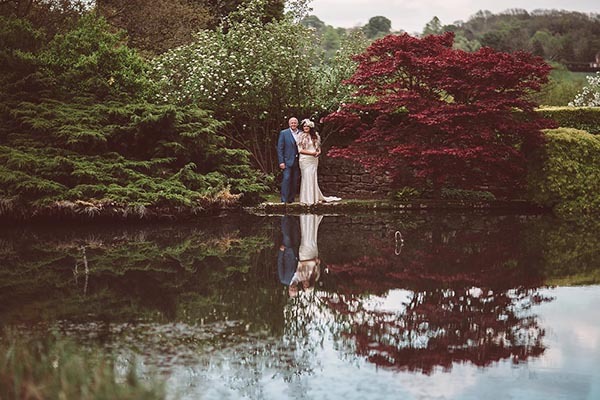 Graham and Jo were absolutely fantastic – so professional, they arrived 90 minutes before serving drinks and yet seemed to have been part of the planning from the start. They ran everything so smoothly and were skilled in appearing just when they were needed but never when they weren’t. All the guests were blown away by the food and the wonderful service so much thanks to all your team for making our night so special. Thank you so much for making our dreams come true and bringing all of our ideas to life. The food was absolutely amazing, we even managed to get some leftovers which we enjoyed on Sunday afternoon. Can you pass on our thanks to Sophie as she was amazing! Could not have pulled it off with out the two of you. Just wanted to say a massive THANK YOU to you both for Saturday. You have both been incredible throughout the entire process. You’ve kept us calm and collected and I feel like every bride needs a Nicci and a Sophie to depend on. The day could not have been more perfect and we have you to thank. Our guests have all said it was the best wedding food they have ever had and I’m sure you will get a few more bookings from it. Such a beautiful day – I want you both to plan and cater every family event we have from now on haha!!! Nicci + Sophie (and all the staff from the day). We just wanted to say such a massive thank you for making our whole day special. I really can’t put into words how amazing everything was. So many guests have commented on the quality of the food and service. You both made our wedding great!!! 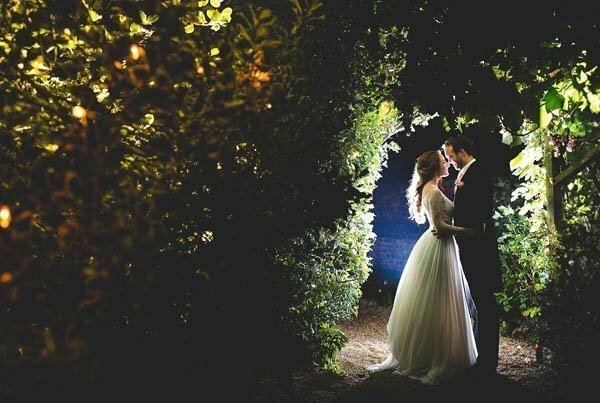 We are still in the ‘wedding bubble’ after a fairytale wedding! We enjoyed ever minute and all our guests did as well. We have been told that everything was either great or tasty! So absolutely perfect!!! You, Sophie and the rest of the staff did an amazing job and the whole day surpassed our expectations. And we even had some sunshine!! Thank you sooo much! I will share some pictures with you at a later stage! Thank you so much for everything – a day to remember and all because of you! We are so happy we chose you as caterer/organiser as the day turned out to be ‘so us’. Sophie – you were born to be front of house manager! Thank you sooo much for everything!! We felt in safe hands through out the planning and knew that we could run any ideas past you. We gad so many people comment how lovely the food was and the presentation of it. We felt that decoration food and service just matched perfectly! Sophie – you were born to be front of house manager! we loved how you managed the day – very calm and not intrusive. Great! The rest of the team did a great job too! Just thinking about the day brings a smile to our faces! A lot of thanks have to go to you, Sophie, and the rest of your team, for making our day so special for us: for that we’ll be eternally grateful, and never forget you guys! On a side note, and not completely unrelated, my brother and sister enjoyed your food so much, and asked me to enquire as to your availability at the start of July. As it’s our mum’s 70th birthday and we wanted to one’s if you’d be able to supply any food for the occasion? Not a sit down meal or anything, just some nice food we can either reheat or put on a BBQ? 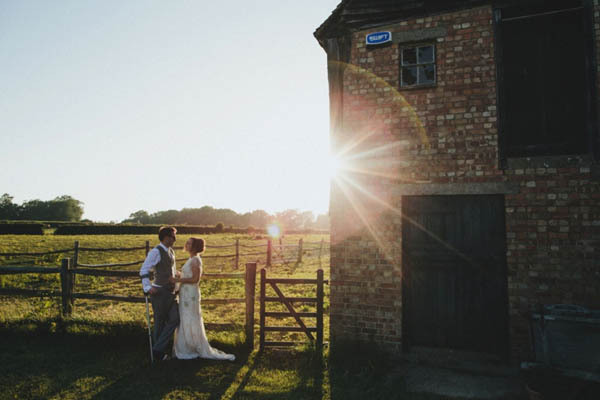 We’re looking at the weekend of July 1st… I know you’re busy with wedding season well and truly under way, but if you don’t ask, you don’t get! Apologies for the delay in my response- we’re now back in Perth (slightly depressed!) after an amazing honeymoon in Italy. Sorry we didn’t get to see you to say goodbye as well- the hall was all organised beyond picking up our stuff, so thank you for the clean up. I’ve attached a couple of pictures that some of our guests took (particularly of the pavlova!) I’ll forward any others that come through if these are useful. 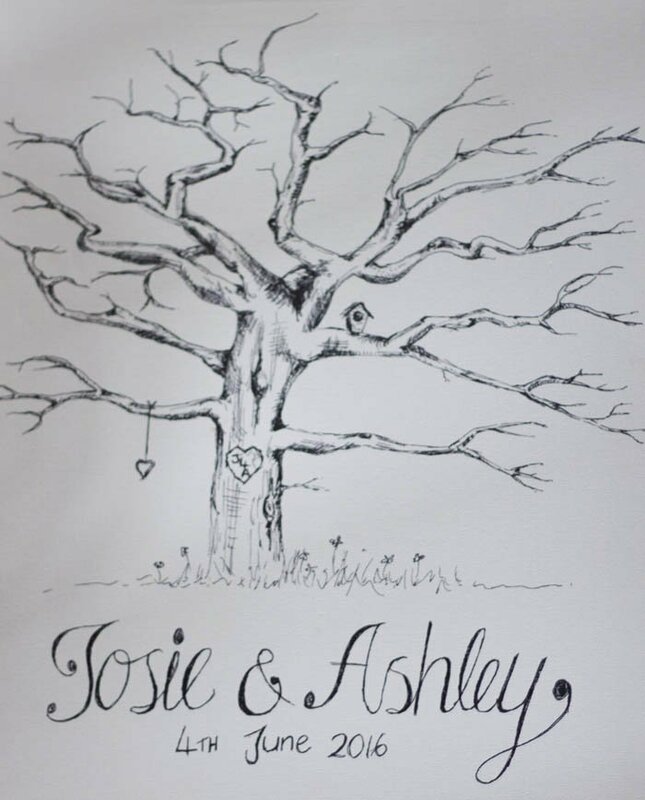 Let me know if there’s any thing you need from us- I know a couple of guests who were looking to get married in the next couple of years asked for your details so I’ve passed these on. Thank you so so much for the amazing job you all did last weekend. Philip and I had an absolutely perfect day and everything was so much better than we could have imagined!! 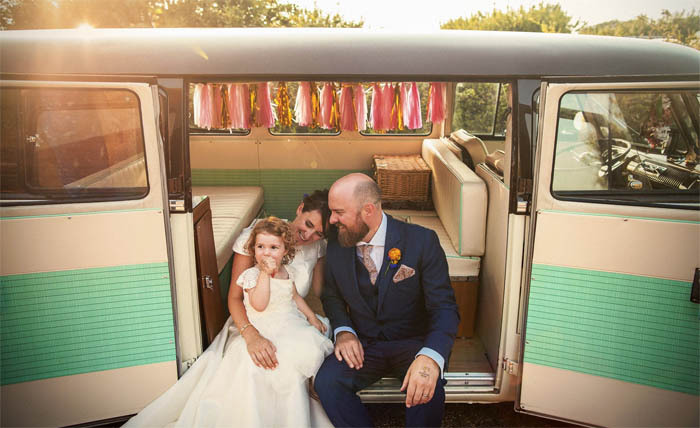 We have had so many comments about how fantastic the venue and food were and we are so grateful to you all for playing such a big part in making our wedding so memorable and exactly what we wanted it to be. We got home last night to our wedding photos, exciting! There are 900 so we’re going to spend some time going through and editing but we’ll share some with you guys when we have because the House Meadow and the food look so incredible in them!! Thanks for your email – we were sad not to get to say bye too, it’s been such fun working together and then it was all over in such a flash!! It was so lovely hiding out in the yurt having breakfast together – we certainly tucked into our goodies!! I hope not too much was broken, but we really dont mind paying for what ever was!! We had just the most amazing day/evening and felt that things could just not have been any better for us!! Your team certainly brought the day together just as we imagined it. Thank you for taking on our vision so perfectly and making it all happen!! We enjoyed our few days at The Pig it was a very relaxing environment- but I was disappointed with their food after having been spoilt by you! Despite sending emails months before to confirm my dietary needs when we go there there was no almond milk or any gluten free bread etc. It was very bizarre as they showed us our booking notes which had it written on but they just hadn’t done anything about it before we arrived so I didnt get a cup of tea until day 2!! The only thing that has cropped up since the wedding is a bit of confusion surrounding what actually happened with the taxi situation at the end of the evening. Do you think Sophie could explain a bit more about what happened, if people were waiting a long time, were shuttle runs operating back to the hotels as they should have been? I only ask because I think Stoff wants to discuss/complain to the taxi company that we booked as we dont think we got what we paid for! Also, perhaps when Elisabeth brings the other bits back to you – do you think you could give her my Kransakage tins please. Just as a reminder, I would definitely love those pate recipes when you get a chance – probably after wedding season is over and you have some breathing space – no rush!! I’m not sure if Jamie (our photographer) gave you his details or not but I’m hoping he got some good shots of your food etc – when we get our photos back I’ll be sure to send you any that show off your fab work and team! Jamie only asks that the photos if used are credited to him. Just a very quick massive thank you from us to you both!! Sophie – you worked so hard and kept our day running perfectly! People commented on how incredibly organised you were – but also how much fun!! Nicci, the food was devine, Stoff and I just wish we’d eaten more – especially the pates which were all we could think about when we woke this morning!! So many people came up and commented on how fun the serving style was and also how they had never eaten so well at a wedding before!! So thank you, thank you, thank you for being just an incredible team that helped make our dream day come true!! P.s – you must tell us how you fixed the weather for us! 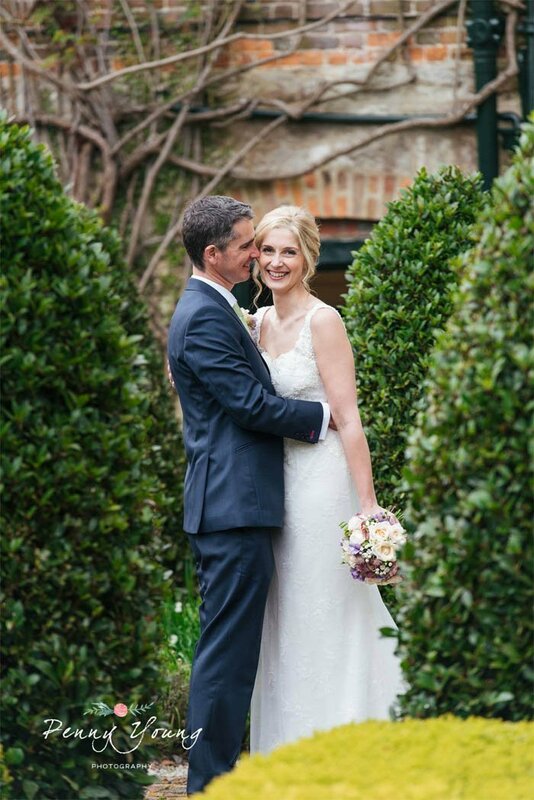 I can’t begin to thank you and your amazing staff enough for giving Emily and John the perfect wedding day. The food was absolutely delicious, and the service was faultless. I also know that there were lots of you behind the scenes helping to cook, prepare and clear up, who did a fantastic job, and the day ran so smoothly thanks to you all. I lost count of how many guests were singing all your praises for today, and every single one of them said that they had never been to a wedding with such fantastic food and service before. The extra little touches were incredible – I will treasure my beautiful menu card and my drinking straw for ever!!! I will see you tomorrow to thank you in person, but I really wanted you all to know just how much we appreciated everything. Please pass on our thanks to all your fantastic staff. Thank you so much for what truly was the most amazing day of our lives. We loved every minute of it – and having you and the team there to make sure it all ran as smoothly as it did really made the day. Everyone has commented on how wonderful the food was – obviously we knew this would be the case, but hearing it from the guests was great! Thank you all so much for the work that went in on the days leading up as well – I hadn’t realised quite how much the team do and having everyone around to help out with the last few bits was amazing!!! Wow, awesome, you are fantastic. Everything was perfect , what a wonderful evening. What a truly great evening – we had such a good time! Sophie ( and later on the rest of the staff) was amazing in helping us keep calm and collected , and did a fantastic job with her own decorations and making the whole thing work. Many thanks indeed to her. But also to you , for the fabulous food! You impressed an awful lot of people that night. Thank you also for steering us so deftly through the maze of possibilities. Frank will email you the bank details shortly. following hard on Ros’s heals, but also to endorse what she’s said, everything about the party was fantastic. we had a wonderful time and so did everyone else. We really wanted to give everyone a memorable time and a good surprise with something special, and we really delivered that with your help. The thanks we’ve received from our guests after the event said it all… so many people were blown away by the food and the catering. Mind you, Ian’s piping struck a chord with many too, the chief caterer amongst them… delighted for that! Last weekend was just so fabulous and everyone had such a great time. You and your team played a massive part in that so thank you so much for your amazing service and incredible food. It was a real pleasure to have you there. Dear Nicci, a huge thank you to you and your helpers for the most delicious and professional lunch after the funeral on Friday. Everyone said it was all so tempting that they had thoroughly over eaten (in the nicest way!) and the éclairs were especially singled out! The way you had laid it all out was perfect and you managed extremely well in such a cramped kitchen. Thank you again so very much indeed, it was a huge weight off my mind that you dealt with all my requests so easily and made any decisions so decisively. Just wanted to say a big big thank you for the wonderful food at the wedding reception on Saturday. Everybody commented on how good it was, the only complaint was they were all too full to eat more, we didn’t want to leave a bit! It’s impossible to pick out a ‘favourite ‘ because it was all so good but the alcoholic jellies and ice cream were a big hit as dessert. Can you also pass on a big thank you to all your staff. They were all so attentive and friendly, Brian seemed to be everywhere at once making sure all went smoothly and everybody was happy and enjoying themselves. Forgive me for not thanking you in person on Saturday. Everything goes by so fast you don’t have a chance to see everyone you want to and I didn’t want to get in your hair in the kitchen! It made such a difference knowing we could leave it all your hands. I didn’t once worry about that side of things in the lead up to the day because I knew you would deliver and you did. We just wanted to say a massive thank you for all your hard work, spectacular food and fantastic service at our wedding on 19th July. We had the most wonderful day and absolutely every person commented on the food and how wonderful you guys were. You made the day so special and we cannot possibly thank you enough. The photographer was pleased with the wedding that he is submitting to the wedding mag and will be sure to get you mentioned should they be published. Once again Nicci, your food was amazing, you had everything covered and went above and beyond expectation. BEST CATERER EVER! Thank you so much! I wanted to email you (I was hoping to get thank you cards but they’ll take a few weeks to be delivered and I don’t want to seem rude!) to say the biggest THANK YOU to you, Brian and all your wonderful team who made our wedding day everything we wanted and more. 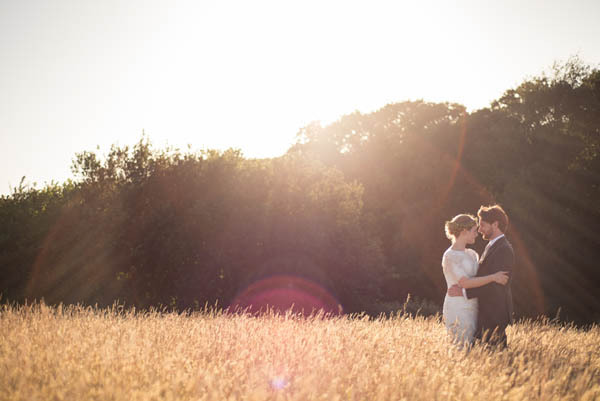 We had a perfect day-even the weather was perfect in the end. From the very beginning you were so helpful, like a fairy godmother! You made everything happen and it was so stress free which allowed us to enjoy the build up! Then on the day, all your staff were perfect. I think they were just as attentive to our guests as they were to us-and our special champagne coupes nearly made me cry! You’re so thoughtful! Special thanks to the lady who rocked my cousins baby while she ate (I can’t remember her name!) and to the younger waitress who was on the bar in the evening who encourages my bridesmaid do shots of mead (never occurred to me that you could do mead shots!). Everyone we spoke to on the day, and since has said it’s was a wonderful day, and even if they’re just being polite, we had a fabulous time and I just want to do it again and again. And then mummy told me you could freeze the cheese and pate AND there was leftover pavlova and my life was complete. The pavlova was demolished the next day and mummy has made delicious jam from the strawberries. I’ve half been putting off sending this email because it means that I have to admit it’s all over, but I just want to say thank you from the bottom of our hearts for a perfect day. First I must apologise profusely for the delay in sending our thanks. We have been waiting for our photos so we could do a postcard & they have taken yonks’! I do not even know where to start with expressing our gratitude for the monumental effort that you and your team put in to making our day the most unbelievable incredible day that it was. The food was utter spectacular and many of our guests have since commented on it being the best food they have ever had at an event. Every member of your staff was perfect, polite, attentive&+ I didn’t spot an empty glass all day so obviously working hard. Above all I want to thank you for being the best person we could have possibly asked for to be overseeing our day for us. It has been such a pleasure to get to know you & thanks for doing the most brilliant job!!! I cannot thank you enough for everything you did for our day. Obviously the food was completely amazing and stunning (and everyone said so ….so many people told me it was the most brilliant wedding food they had ever had). 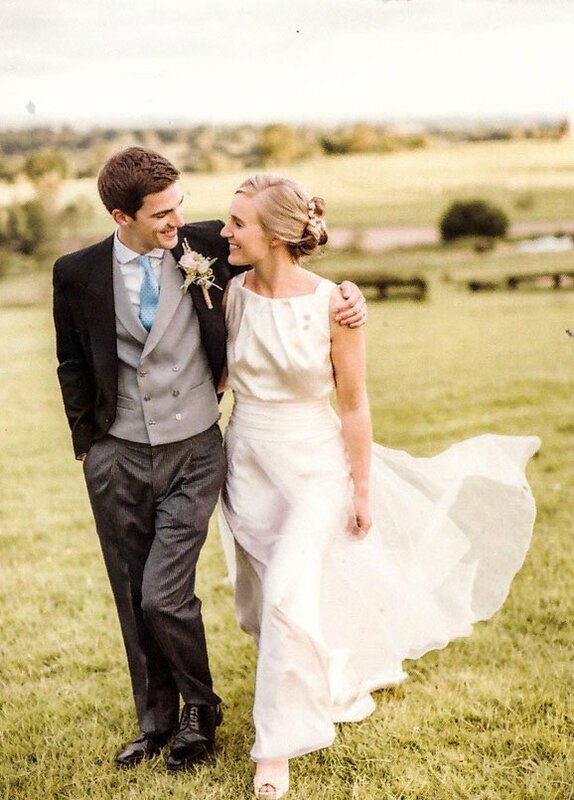 But you created our perfect day by doing so much more than that – we knew you would when we first met you! 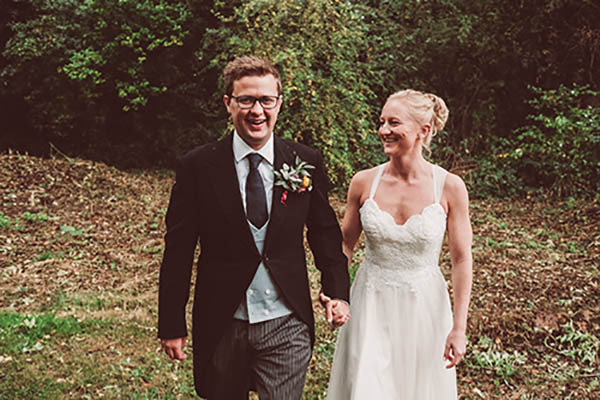 I want to do it all over again – it was such a happy, lovely day. All of your staff were so lovely too – please pass on our thanks and appreciation! We just wanted to say a massive thank you for everything you did for us to make Saturday so amazing. Your food was better than we could have ever expected and every single guest has complimented it and made a point of telling us how much they enjoyed it. It was fresh, tasty and artistic and went so perfectly with our theme. Bryan and your team were also so wonderful. They were so friendly and attentive, an actual pleasure to have there. They were so quick to attend to our guests without being overbearing and even though they were battling slippery grass and low sided tents they were still so up beat and willing to help. It was so lovely for Ash and I to see our guests digging in to the pork and chicken and ask for seconds and thirds as they reached across each other to get to the salads. Everyone was very excited about the edible flowers! And then to see them all get up and dance between courses, which was something we were never expecting, only to return to their seats when they saw the brownies being served! It was exactly what I wanted! We are beyond grateful for everything you did for us, thank you for making such a huge part of our day so memorable. We have honestly had so many lovely comments about your food and staff, it’s so great to hear. Thank you to you (and both Sarahs) for making our evening feel so enjoyable and relaxed. He loved every minute of it and I know that he will always look back on his 18th with such fond memories because of it. In fact we spent the whole weekend celebrating which was such good fun. Everyone without exception mentioned how delicious the food was and beautifully presented too. The Beef Wellington canapés for us were a particular favourite. Everything was just perfect. Thank you and hope you didn’t feel too tired the next day. So thrilled with the whole evening Nicci, I can’t begin to tell you how much it all meant to us. 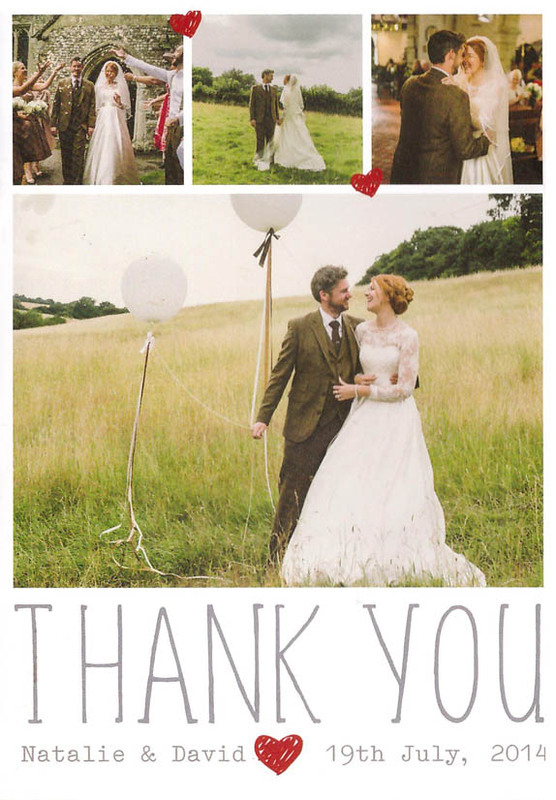 Just a note to say a big and belated thank you for all your help and support in the head up to our wedding. 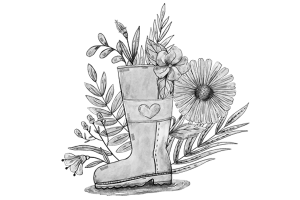 We both had a fantastic day, full of fun and festiveness.We were overwhelmed by how much thought you had put in – even down to the little touches, like button biscuits. It was the perfect day with perfect food and we could not have asked for more. You really do go above and beyond in order to make things unforgettable.Enclosed is a small gift to say thank you. We would not have changed a thing and want you to appreciate how much our happiness was down to your efforts. Wishing you a happy new year and every success with your amazing work. It was a wonderful evening & the compliments to your food & ladies who work with you keep on coming! 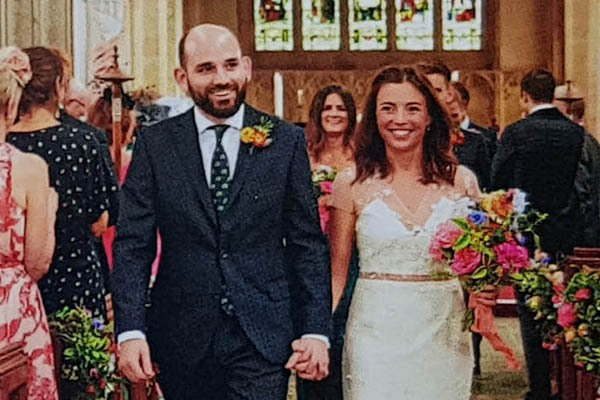 I must apologise for the terrible lateness of this, I realise hectic is not an excuse so I am sorry, however I hope you received the card?I just wanted to again say how Thrilled Jon & I were with everything. It was a wonderful evening & the compliments to your food & ladies who work with you keep on coming! Thank you so much for making it such a fab night! We had a great honeymoon thank you – it was really chilled and just what we wanted/needed! !Thanks for sending this through, we will pay tonight when we’re both home. 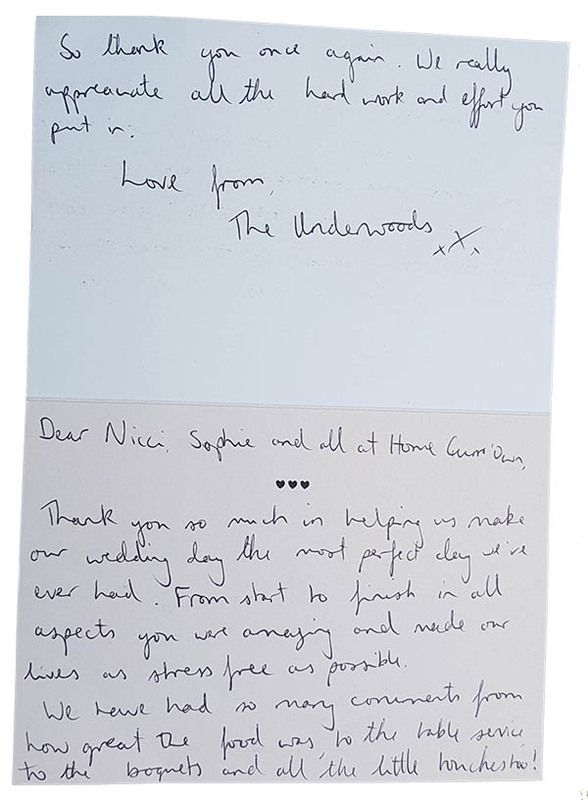 I cannot thank you enough for everything you did for us Nicci – your food was beautiful – so many of our guests commented on that, and also everything else you did in the run up to the wedding made me feel like ‘everything will be okay’ throughout the whole process – you are such a star!! 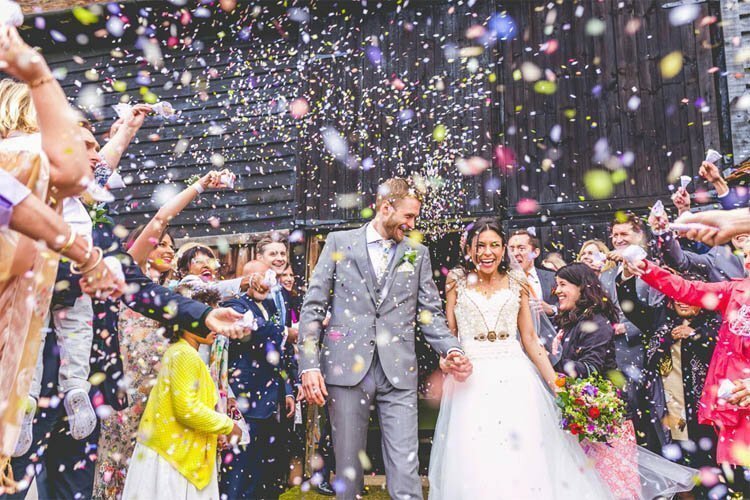 More than two weeks on from our wedding day and we are still on such a high because it was the most magical day that exceeded our wildest dreams. So much of that was down to you and your amazing Home Gurr’own team. 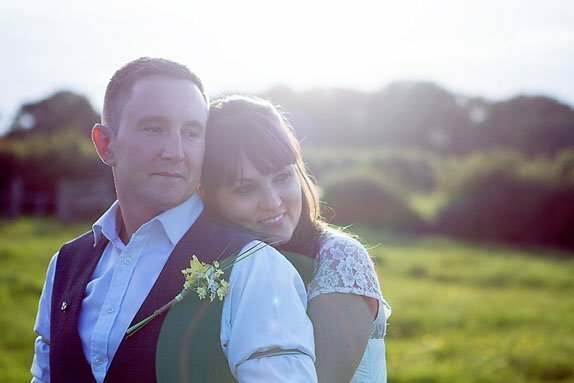 From the first glimpse of your website and initial response to our enquiry, it was clear that we wanted to work with you on our big day and vice versa with your friendly and generous approach. You have been fully engaged, patient and responsive at every stage, pre-empting and addressing any needs or issues which made the whole planning process an actual joy and eliminated any stress. 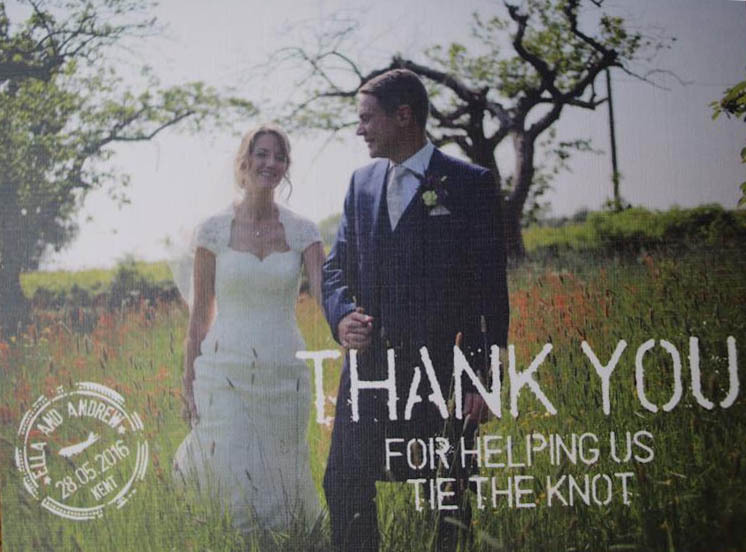 You and your team went above and beyond to make sure every detail was perfect and that everything ran to plan to make for a very relaxed and happy atmosphere.It was also so great to benefit from your fantastic network of local suppliers and producers giving us the highest quality Kent products. 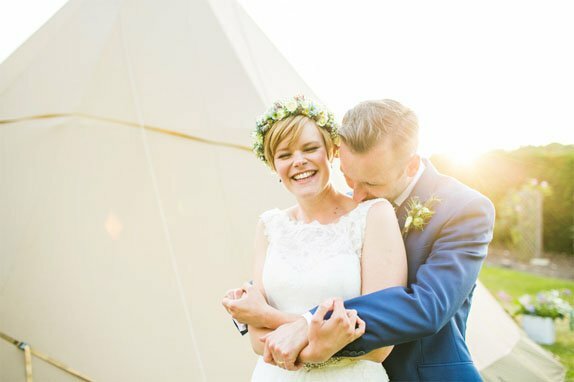 Not only that, your recommendations, support and co-ordination with arranging the marquee and all other equipment needed – thinking of every detail, and choosing the suppliers for the quality of their equipment and with the same service standards as yourself was invaluable. Having sampled the menu, we knew the food was going to be good but when mixed with your amazing presentation, served by your fantastic staff and enjoyed by so many, it can only be described as completely and utterly divine and delicious! 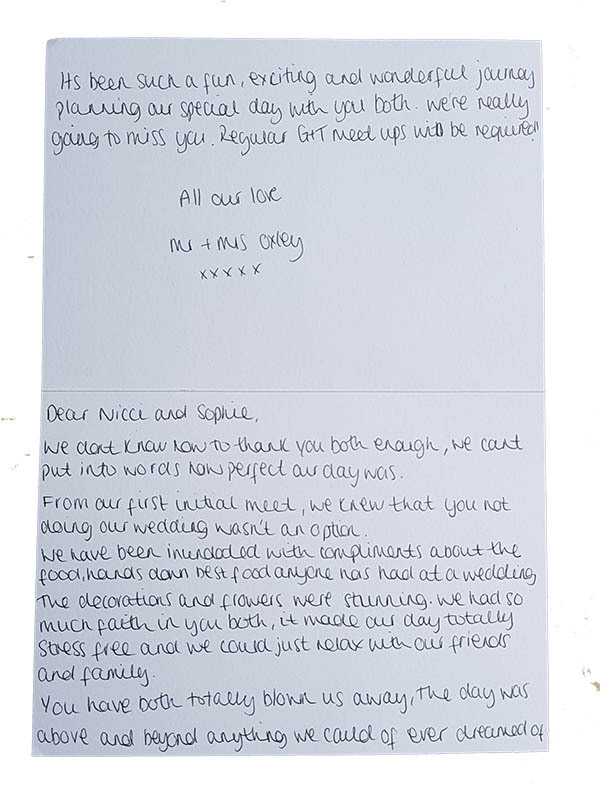 Every thank you card we have received has mentioned the simplicity but originality of the canapés, main menu and cocktails, and the presentation and quality of the food being simply outstanding. We cannot thank or recommend you enough! 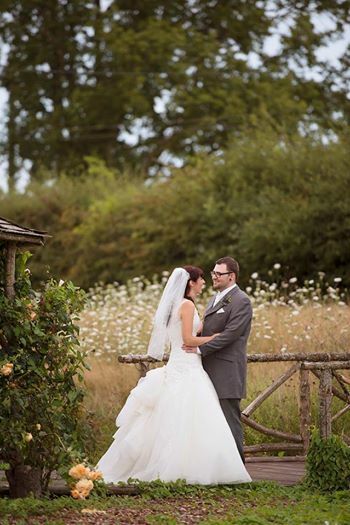 We want to say thank you to you and your team for everything you did to make our wedding day this wonderful.All the prep, all the logistics, all the pride and care you put into everything you do was glaringly evident from the quality of the food and seamlessness. You are a marvel and added an element to our day we never could have imagined when we started out on this mad road. We are proud to know you, would recommend you to the world and hope we stay in touch. I just wanted to write to say thank you so much for your hard work and support on Friday evening at Mum’s 50th – we all had a fantastic evening and certainly could not have done it without Bryan, Sophie and yourself. The menu hit the spot and the table set up looked so beautiful, it was exactly what we had in mind.Thank you for helping us to make this such a special evening for Mum, and if we have another event to organise in Kent any time we will be certain to give you a call! Apologies for taking so long to write properly to you – we snuck off to Somerset for a few days before we had to be back at work today. Firstly, thank you, a huge thank you for everything you did for us. Everyone we have spoken too has complimented the food and the staff – they have used the word ‘best’ alot! But more than this I want to thank you for the stuff behind the scenes – the preparation and the management, the planning and the love. You approached our wedding like we had known you all our lives and there was a level of devotion I remain totally moved by. The way you organised the room and the schedule and the food and the cheese – honestly I cannot really find to words to express how grateful we are for everything you did, but here goes! !…For anyone wanting food hand cooked with love and flair, for strawberries so ripe they sing in your mouth, for a smiling face in a kitchen when the countdown clock is on and 150 eager little faces need fed need look no further than Nicci. From the very first email we were treated with kindness and interest, a seasonal menu planned around us and our favourite things. Nicci is more than a wedding caterer, she is a wedding planner/friend/advisor/stylist/machine!! Good luck with the rest of ‘the season’ and for your future career. I will be singing your praises for years to come. Hope you aren’t too exhausted today! I didn’t want to wait until after the honeymoon to say thank you from Jon and myself for all your hard work this weekend and in the run up too. 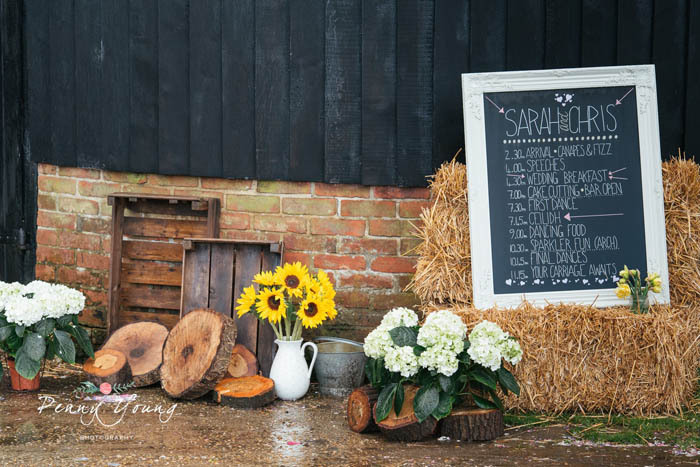 We had so many compliments about the food (‘best wedding food ever’ was said more than once) and it was exactly the rustic, country feel we were after. And you got compliments from New Yorkers on the Reubens too! 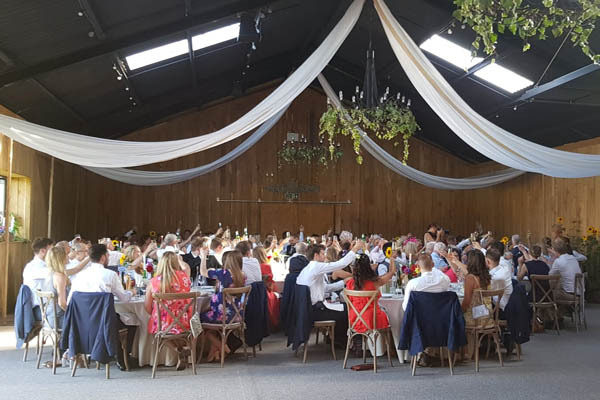 But more than just the food – all the prep, organising, help before and after the wedding (both sets of parents remarked on how great your team was too – and helpful this morning) – was so appreciated, we couldn’t be more pleased with how it went. Home Gurrown catered for my father’s 70th birthday party, a small, personal affair.The food was out of this world. The waitress absolutely divine. But Nicci herself made it extra special with her upbeat attitude and her attention to detail across every element of the event. From the quoting all the way through to the sparkling clean kitchen at the end! I will use Home Gurrown again and again for all my special events and would recommend them to anyone who loves local produce that’s beautifully prepared and served. Hope they were great and you got the chance to relax properly! 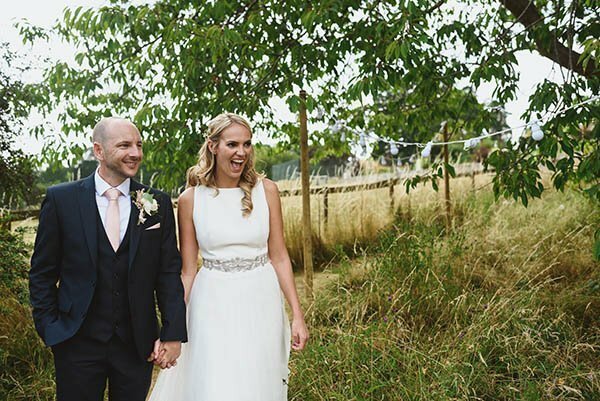 We just wanted to send you an email to express our huge thanks for your work on the wedding.The food was sensational and has been mentioned by virtually everyone, not only for its tastiness but also for the way it fitted the mood so perfectly. 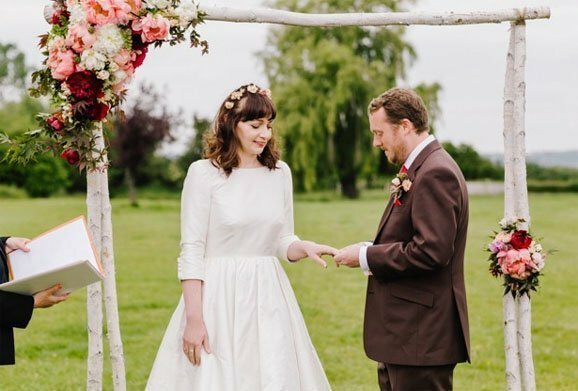 Both of us loved the fact that we never once felt you were churning out a “Winter wedding menu option 17” that had been used on millions if other people. Everything felt personal and you all worked so hard. Your staff were amazing and again, were commented on lots by guests.We’re not going to get the opportunity to have a party like this again and are so pleased that we prioritised the food and went with you. It all worked out beautifully! I just would like to say, belatedly, how pleased I was with the wonderful food at Miriam and Ben’s wedding recently. I know my husband has already told you, but want to tell you too! My only problem is that I didn’t really eat enough of it as the occasion was so exciting and I didn’t do justice to the delicious food. I did,however, have a plate of the wonderful vegetable kebabs and salad later in the evening with some of your home made chutney and it was great! And the fruit salad instead of the waffle option was lovely. I was particularly impressed with all your staff; the attention they paid to detail and their helpfulness all round. The flowers on the tables were beautiful and thank you so much for providing those. 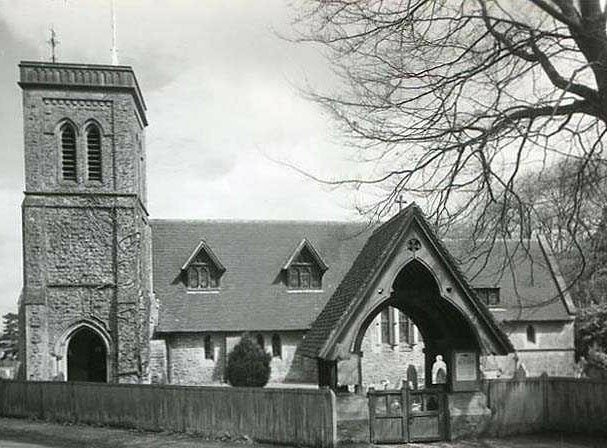 I intended taking a jar to my parents’ grave in Biddenden on the Monday but sadly left it behind at a friend’s house en route, but I know that they, who were great gardeners, would have loved them. I have just seen your mention on Stephen Bunn’s website (Photographer) and hope that this will help you in your future. 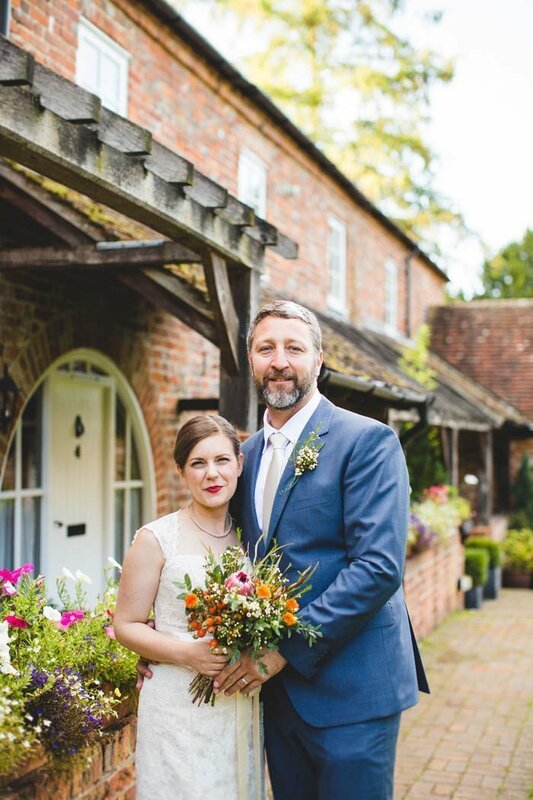 I am so glad that Miriam and Ben found you and that locally grown food was a feature at their wedding. My parents were farmers and having lived through WW2 were passionate about growing and providing food locally. The food was awesome and I think that was pretty much the general consensus. Just wanted to say thanks again for helping to make it such a great day for us and all our family and friends. The food was awesome and I think that was pretty much the general consensus. I think you got a compliment off my auntie who’s been in the hospitality trade for donkeys years and is quite economic with her praise… so well done! The food really complimented the venue, couldn’t have been a better match… Sadly we missed out on the pasties (think we were too busy dancing), but again everyone loved these. Thankfully we got some of the cheese after the event and again great choices! So thank you so much. And thanks to Brian and Claire who were so helpful on Friday and obviously Saturday too. Both really lovely people. 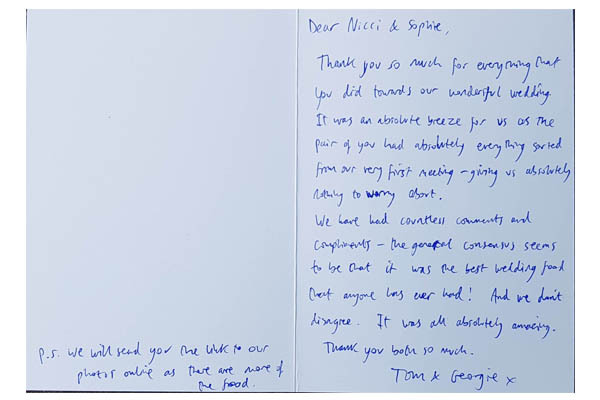 When we get the time, we’ll try and write something a little more enthusing (we’ve not even got around to the thank you cards to our guests yet)… but we think you, your team and your food are fantastic. Not sure where to even start thanking you for our wedding catering and everything else you did for us, it’s hard to even put into words but you know me so here goes. 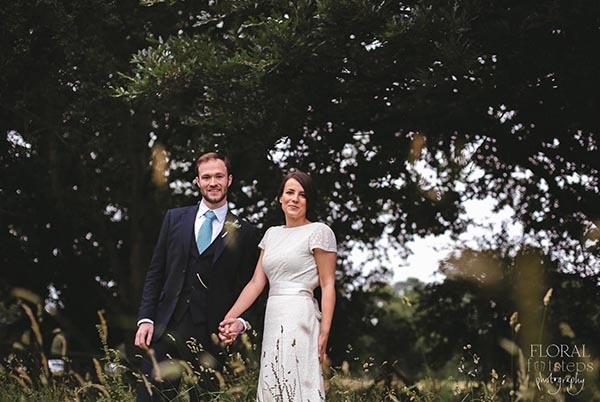 The catering for our wedding was completely OUT OF THIS WORLD.It was utterly flawless, not only myself and Doug but not one of our guests had experienced anything quite like it at a wedding, and some of them have been to some pretty serious weddings. This was wedding catering on hard-core steroids! Everything was perfect. So delicious, so beautifully presented, so creative, it was stunning. You really took it to another level. You took it much further than we had ever imagined possible. The attention to detail and how personal you made it to us as a couple was enough to make grown women weep. Literally on more than one occasion as you saw. I am practically going again now just thinking about it all. There were so many extra little details and surprises we had never expected or would have ever been able to think up. So creative! We LOVED IT! The fender Stratocaster guitar biscuits! The butterflies for me, if you could see my face when I saw those. The colour coordinated heart shaped sugar cubes – wow! The beautiful tea in the gorgeous tea pots. Totally amazing. The crème de menthe ice lollies in the, oh so scrummy mojitos. The personalised cutlery was so cool. Which I have kept a reminder of for romantic picnics for the rest of our marriage. The way you presented our evening buffet. And the bar! It was so beautiful and so perfect, you are a genius, it was incredible. We have had so many calls, letters, and emails from guests since telling us it was the best wedding food they have EVER tasted in their lives. We had the non-drinkers, the allergy sufferers, the pregnant women and many of the older guests telling us they have never been so well looked after and never made to feel such a part of an event like that. So important to us We are feeling very lucky that we got to have you cater our wedding. We will never forget it. Those brownies in particular will stay in our hearts forever. Ha Ha . Not only you and your food are so impressive but also your staff. Brian and Clair are invaluable, so much fun and just all round lovely and amazing. They are great people to have and all of your lovely waitresses, all smiles and noting too much trouble. Not only were you an amazing caterer but you were a real support to us throughout the whole planning period. For the past year you have been like a wedding fairy godmother. Giving us things that fell completely out of your job description. It was amazing of you, and we cannot imagine how we would have coped without you. Everything you do is done with such passion and it really comes across how much you care the job you do and also the couples you cater for. I am not sure you should really be described as just ‘catering’. It’s so much more. Frankly Nicci we don’t really know how anyone could ever get married without you, you made it all so happy and nice and fun and we are so incredibly grateful to you for everything you did for us and all your hours of hard work, you’re amazing. All our love an best wishes for the future of your company, your family, an everything you do, we think you’re FAB. Sorry for the delay in emailing you- I think I am still recovering from Kate and Doug’s wedding, work has been a struggle this week! Just a quick email to say how nice it was to meet you and the food that you served at the wedding was mind blowing- we are all still talking about how amazing the food was. Your organisation and attention to detail was particularly impressive and it is very evident that you love and take real pride in your work (I am very jealous of the walkie talkies and earpieces! )As and when we have the next party at Dads house we will be calling you straight away to help with the catering! We just wanted to say a massive thank you for the wonderful picnic that you prepared for us and our families at the weekend. The food was absolutely delicious as always and went down a storm. We feel very lucky to have such a fantastic, talented and enthusiastic caterer (and more) on our A Team. Happy to talk about the oven you mentioned and any other queries you may have any time. Good luck for the future. I’m sure we will meet again! Thanks again, we can’t wait to see you soon. You were an absolute star for me last Saturday. You were an absolute star for me last Saturday. From the moment I laid eyes on one of your salads at the farmers market last year and subsequently met you, I knew I need look no further and was in safe hands for our barn dance supper. Since Saturday I have had a shower of thank you letters all of which mention the food in genuine amazement and glowing admiration that a simple hog roast with salad and strawberries could be so delicious. For my part I thank you for taking any concerns off my shoulders and presenting everything with such rustic originality, attention to detail and infectious good humour! I’d love to see the photos you took! I’m sure we will meet again! even the non-foodies were going back for seconds. 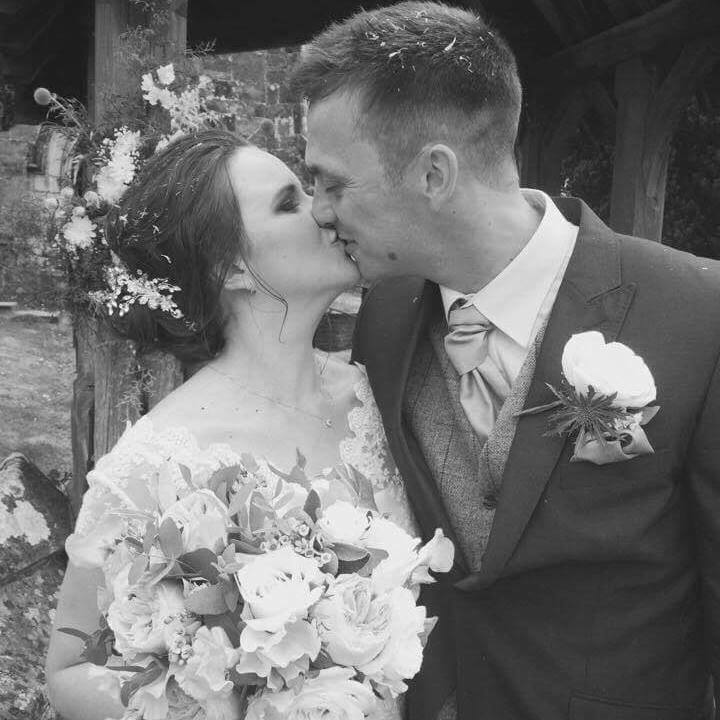 We’re still in Italy at the moment – eating and drinking our way through Tuscany but thought we’d just take this time to thank you again for helping to make our wedding day so special. So many people commented on how amazing the food was – even the non-foodies were going back for seconds  You actually got my son to eat fish which is something I haven’t been able to achieve in 21 years of force feeding him:). A special mention for your staff as well – again, there were so many comments about the level of service and the attitude of the staff- we really couldn’t have asked for more. We can only echo what Dave says in his blog, we felt like we were saying goodbye to friends at the end of the wedding and hopefully when we’re down that way again (which we definitely will be), we can give you some warning so we can meet up for a drink. We’re still getting comments about the venue and food two weeks on – our guests absolutely loved the whole thing, needless to say so did we!!! Nicci – a few people have been asking where they can get the chutneys and salad dressing…you’re in demand! Scotch Egg recipes have been requested too!!! Clare – I’ve booked a van for this Friday afternoon to come and get the stuff that’s in the barn. Think Joe’s coming with me again to help – is Friday ok with you? We were delighted with Home Gurrown’s catering which we used for our recent office launch event. We were keen to get a caterer who could provide local, Kentish fayre. Nicci didn’t disappoint; she took great care to listen to exactly what we needed and she delivered a high quality product and service. Our guests commented on how tasty and original the food was and how much better than the usual canapés you get at business events.We would definitely use Home Gurrown again. your food received lots of compliments. Thank you very much for everything Nicci.Saturday went very well and your food received lots of compliments. You made life so much easier for me and I just know I would never have had the time to do it all without you so, many many thanks Nicci. I will definitely come back to you when doing anything like this again. such an unforgettable feast and display. Again a big thank you for creating such an unforgettable feast and display. We loved all we ate that day and our guests are still reporting such all delicacies they tried and discovered that day – that makes it even better if possible. Thank you also for making some of our food dreams happen for us and pulling of that croque en bouche (it was delicious). And the amazing mussel mountain! We had a wonderful day and we are so happy with what you and your team have done for us, we can not thank you enough. We are getting back into the normal swing of things now and I was wondering if you could send us the names of your team, as we would like to thank them each individually and send then all a card with a tip for the day, We know they did an awful lot of running around and always with a genuine smile-amazing! We would like to give those to you and maybe you could pass them on for us? Let me know if this is ok. Looking forward to your TV program-we will be watching! Also we would be happy to provide testimonials for you, we have only good things to say!